There are close to 20 different aromatic botanicals referenced in the old and new testament of the Bible. These botanicals were used to make anointing oils, perfumes, incense, medicinals, hair oils and skin care products specific for that time in history. It seems that I keep finding myself attracted to these oils. One such herb is called hyssop which in Hebrew was known as ezob. This cleansing herb was sprinkled in some of the sacrifices and purifications used in Jewish ceremonies. The herb was also used to sprinkle blood on the doorways during the exodus in Biblical history. One well known Bible text that mentions hyssop is Psalms 51:7 “Purge me with hyssop, and I shall be clean: wash me, and I shall be whiter than snow.” This text also brings to mind a popular old hymn, “Whiter than Snow”, one I remember singing in church when I was growing up. So now back to balance and boundaries and how hyssop might benefit us. Thinking of balance, what types of things are likely to throw us out of balance? I would imagine that it is safe to say that most of us can be affected by negativity, tension or stress. Those that live with people who have those tendencies can definitely confirm that staying in balance around too much negativity and stress can be a challenge, but not an insurmountable one. Another thing that can bring any of us out of balance in a large way is feeling mentally distressed. So with the above emotional spiritual attributes, we can see how Hyssop can be of benefit to most of us. Now, the first thing Aromatics states in their list of emotional spiritual attributes of Hyssop is that it strengthens ones healthy personal boundaries. Perfect! Healthy boundaries are key to healthy relationships, with the boundaries being specific to each person’s personal needs. And as we are growing a better self, a cleansing of old unneeded emotions would be of great benefit. Great! Check that off the list. So with that freedom, our minds are now clear and invigorated as is also mentioned above. To me this oil supports both balance and boundaries all in one. These are some oils that I like to blend with Hyssop for a well rounded approach to balance and boundaries. Cedarwood - I love that cedarwood increases endurance as well as supports confidence during challenging and difficult times. Davana - I call Davana the Divine Feminine (also good for men) and is perfect here for its properties of calming, balancing, soothing, uplifting as well as dispelling anger. Helichrysum - Use your favorite species, I prefer Italicum. This oil is known as honey for the psyche. Its properties are emotional balance, heals current emotional traumas while at the same time helps heal old emotional wounds. It is emotionally balancing and encourages intuition. Lavender - Lavender has so many wonderful properties. 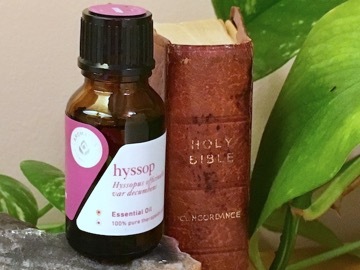 The properties that I love which are specific to use with hyssop are that it encourages balance in all body systems, calms, soothes and nurtures as well as reduces anxiety and fear. Whether it be for emotional/spiritual reasons or physical reasons, Hyssop is a wonderful addition to your essential oil collection. Or, if you want, we would be honored to make you an inhaler using hyssop along with any of the above oils that call to you. Note: Make sure to purchase Hyssop chemotype 1,8-cineole (Hyssopus officinalis var decumbens) rather than the hyssop essential oil made from the Hyssop officinalis plant as it can be irritating with its high levels of ketones.